The Tiwa- and Tompiro-speaking pueblos in Central New Mexico, Quarai, Abó, and Gran Quivira, blended Mogollo and Ancestral Puebloan cultural features. 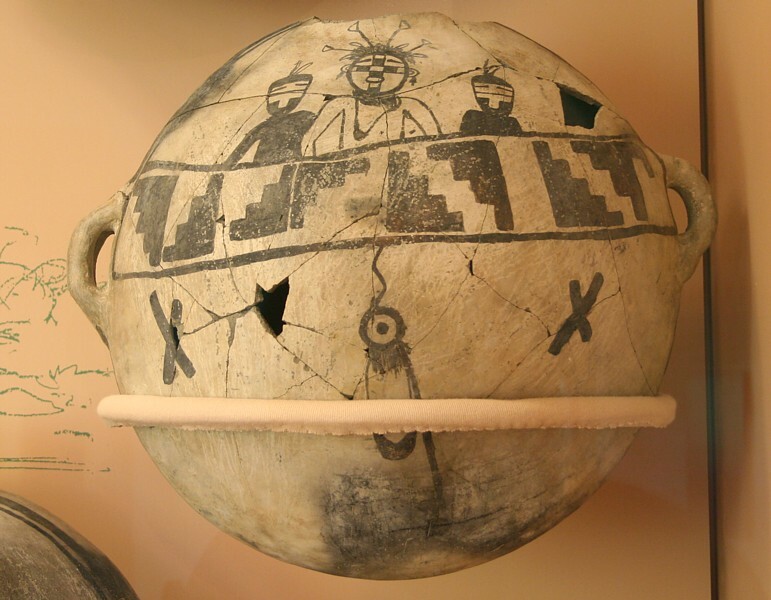 The Salinas Valley, situated between the Rio Grande populations and the Plains Indian, served as a major trade center. 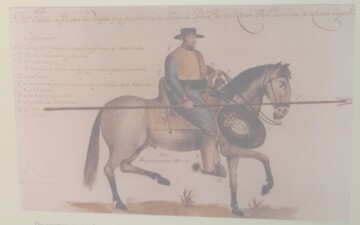 Three large pueblos became focii in the Catholic missionization efforts of the Spanish conquerors during the 1600's. The Salinas District was the easternmost of mission districts in Nuevo Mexico. Fray Alonso de Benavides reported "fourteen of fifteen pueblos in the area, which must have more than 10,000 souls." The mission ruins of the "pueblos de las salinas" district stand as stark reminders of the imposed social change to previous traditions. By the 1680 Pueblo Revolt, construction had ended after a long span of once-thriving prehistoric and early historic occupation of the numerous Native communities in the area. Visitor Center. The Quarai Mission is the most intact and restored of the three large churches. 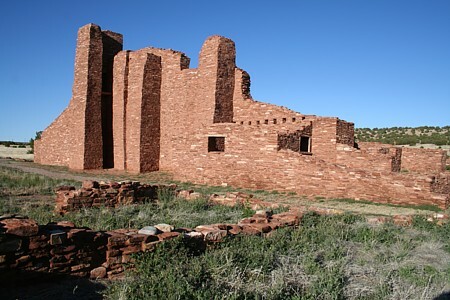 prehistoric and historic pueblo ruins, Spanish reoccupation ruins, and a Visitor Center. While the Visitor Center closes, the area is not gated after the closing hour. At Gran Quivira, unlike the red sandstone at Abó and Quarai, the local stone is limestone. Also, the larger of the two churches at Gran Quivira was never completed. Gran Quivira is also distinguished by the incredible ancient artifacts on display. 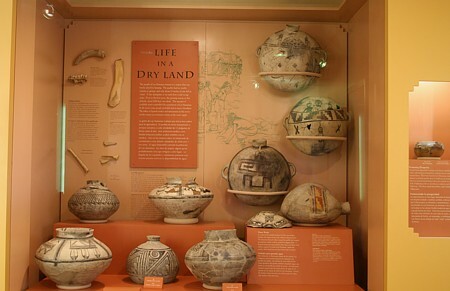 Three unique canteens (upper right) highlight the pottery display. 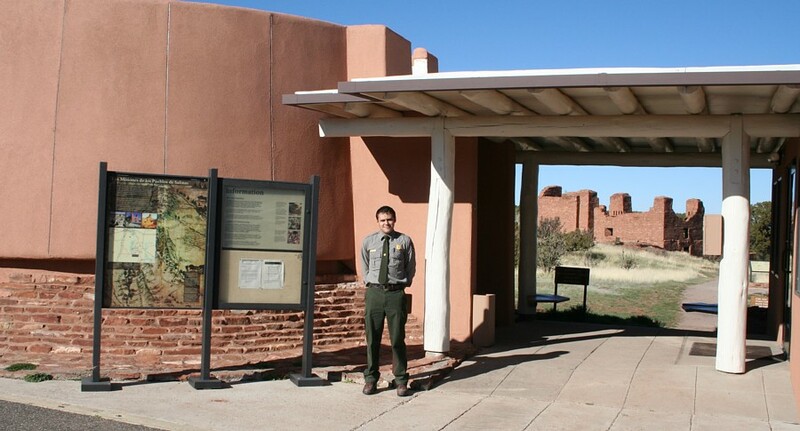 Locations: The National Parks Service maintains a Visitor Center in Mountainair, New Mexico, central to the three sites. Quarai is located north of Mountainair and southeast of Estania, on the outkirts of Punta de Agua. Ao is just off US highway 60 west of Mountainair, southeast of Belen and northeast of Socorro. 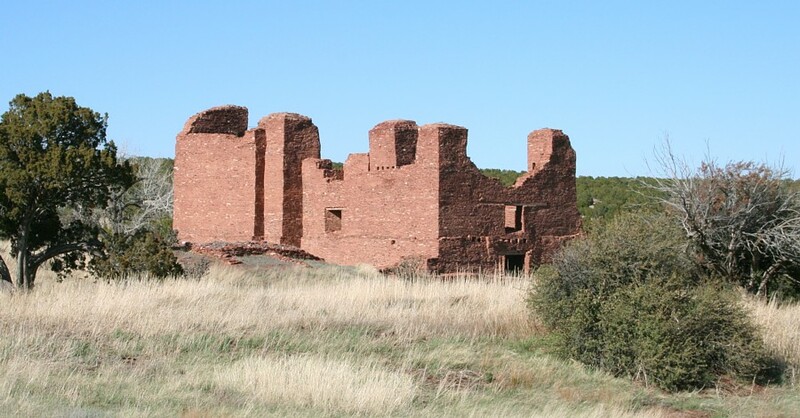 Gran Quivira is located between Mountainair and Carrizozo just of NM highway 55, 25 miles from Mountainair.